GB: When did development of Titan Quest: Immortal Throne actually begin and where do you currently stand in the expansion's development cycle? 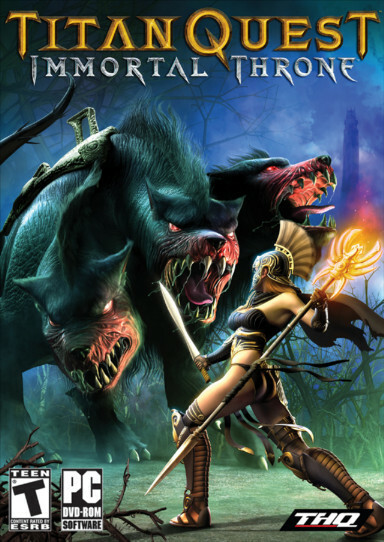 Mike: Production on Titan Quest - Immortal Throne began in early June, just a few short weeks after we went gold on the original Titan Quest. Even while we were wrapping up work on Titan Quest we were already working on creating feature lists and determining what types of changes and improvements we wanted to make in the expansion. That allowed us to really hit the ground running in June. Currently we are working through the final weeks of bug fixing and testing and things are looking really well. GB: What is the premise surrounding Immortal Throne? What will the overall objective be for the player as he travels into Hades? Mike: I will do my best to answer this question without giving away the ending on the original game for those that may not have finished it yet. The short story is that at the end of Titan Quest the pantheon of gods has agreed that the time has come for mankind to inherit the earth and control their own destiny and that the gods are packing up and shipping out. The player soon finds that life in the ancient world is in fact still threatened as it appears that a new army is amassing in the depths of Hades and venturing out into the land of the living which is no longer under the protection of the Olympian gods. In a nutshell, the player will need to find the entrance to Hades and ultimately discover the source of the new army and destroy it. GB: Tell us about the new Dream skill mastery. What skills will this new mastery offer and how will they complement existing masteries and their respective skills? Mike: The dream mastery is really unique in both concept and function. It is not a typical skill family that one would expect to find in a traditional role playing game. Conceptually it focuses on warping the world around you. From a game play perspective we designed the dream mastery to work as a great support tab for either a casting or melee style player, while still holding its own as a primary mastery. There are skills within the tab that run the gamut from crowd control to direct damage. there are a few powerful auras called trances that function a bit differently than other auras in the game. There is even a new Nightmare pet which greatly strengthens the abilities of other pets in your party. GB: How will the new caravan system work to introduce more storage space for characters? Mike: Caravans serve two main purposes in the game. The first is that they provide the player with additional expandable storage. For a fee you can opt to increase the amount of storage that you have. The other service they provide is a way to transfer items to your other characters. So if you find a great staff with your melee character, there is now a way within the game to get that item over to your mage type character, etc. The caravans can be found throughout the ancient world not just in the new content that is unique to the expansion. GB: Aside from the caravan system, what other gameplay improvements will the expansion introduce to the original game? Mike: We have made improvements across the board in Immortal Throne. We have added auto-sort to the players inventory, redesigned the multiplayer lobby, added the ability to lock item pick-up to only occur when using the show item keys, an undo option for assigning ability points, we have added powerful items called artifacts which are crafted by enchanters which requires an arcane formula and a specific set of ingredients, we have also added scrolls, the ability to separate relics from items. the list is pretty extensive. GB: Tell us a bit about the new enchanter NPCs and the arcane formulae that players can use to create artifacts. Can you give us a few examples of such artifacts? Mike: Arcane formulae are basically recipes for powerful artifacts that can be created by Enchanters for a fee of course. Once a player acquires a formula (and they are somewhat rare) they will then need to acquire the necessary ingredients these could be charms, relics, or possibly even other artifacts. Once made, an artifact can be equipped on the character in a new equipment slot. When worn, it will grant the player with new skills and bonuses unique to that artifact. Enchanters can also be used to separate relics from items, although players will have to choose which they wish to keep, as the other object will be destroyed. And like all things in life this service is not free.